A rabbitry in Northern Arizona raising Blanc de Hotot, Champagne d'Argent, Dwarf Hotot, Mini Satin, Satin Angora and Silver Fox rabbits for show and livestock. Rabbit shows can be fun for all ages. Maybe you have or haven’t heard of rabbit shows, but they have existed for about 100 years in the United States. The show rabbit of the early times was the very sleek Belgian Hare. Why show rabbits (or any animal)? To display the finest specimens in terms of health! Who wouldn’t want to proudly show off their rabbit who is well-groomed and well-trained? When a rabbit won in a competition, the breeder would then return home and seek to breed this prize-winner. This would create a lineage of rabbits with the most striking physical features and strongest health. So, rabbit shows played an integral part in the selective breeding and evolution of today’s rabbit purebreeds. Now, the question is: Just how many rabbit purebreeds are there? Currently, there are over 46 rabbit breeds. Every competitor selects a particular breed that has a special appeal to him/her. Sharing these rabbits with attendees to the shows allows people to learn of the breed characteristics, competition, health attributes, and rare breed preservation. The American Rabbit Breeders Association is the largest organization of its kind and it sanctions all rabbit shows in the U.S. and Canada. 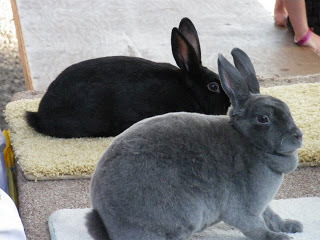 Of course, maybe you are wondering if a pet rabbit can be submitted to a rabbit show instead of a “breeder rabbit.” The answer is yes, pet rabbits are allowed and are exhibited more often than you may think. Naturally, you may be wondering if pet rabbits actually enjoy the travel, the show, all the people, etc.? Typically, they do enjoy it, and, if your rabbit is friendly, he/she may find it exciting and fun to see/play with the other rabbits in the show. It’s a fun and rewarding experience for the rabbit, the owner, and the spectators. Rabbits train well and thoroughly with their owners so they can be in their top form when performing.